Daniel Chessare has opened a Jewish-style deli on Broadway in Saratoga Springs. His establishment, Saratoga Broadway Deli, is open for breakfast and lunches. A Jewish style delicatessen has been added to Saratoga Springs’ eclectic list of eateries. Daniel Chessare said when considering getting into the business, he thought a lot about what Saratoga didn’t have and decided the Spa City needed a Jewish deli. 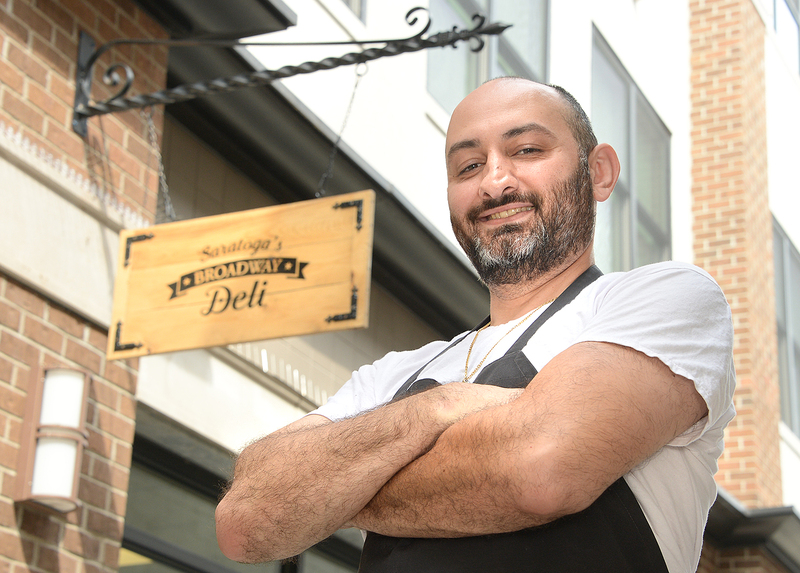 Since opening Saratoga Broadway Deli on July 17, he said his instincts have proved him right. It is located at 420 Broadway, Suite 2, in the Washington Building, behind Kilwins candy shop. “Business has been fantastic so far. We are pretty busy at the lunch rush between 11 a.m. and noon, and weekends have been solid,” said Chessare. Chessare is no rookie when it comes to the restaurant business. He began bussing tables while in high school, working at a restaurant on Broadway. He then began cooking at Professor Moriarty’s on Broadway, eventually working at Scallions in Saratoga Springs for over nine years. After Scallions, he went on to be a sous chef at the Wine Bar before taking on the role as head chef at the Merry Monk. Chessare said he left Merry Monk in September to take some time off to decide what is next move would be. “I stepped away for a while and decided that I wanted was to work for myself,” said Chessare. He said he thought of the possibility of a taco place, a diner or a deli. After deciding on the deli, he kept an eye on the Broadway spot which had been vacant for about a year. He said he the 1,700-square-foot location needed very little work. “It just seemed like a good fit, and it really has been. Other than moving a few things, we didn’t have to do too much to it,” said Chessare. Some of the deli’s best sellers so far have included matzo ball soup, chopped liver and tongue sandwiches, knishes and pastrami. Chessare said they are not a kosher deli, but more of a Jewish style. He said feedback from both locals and visitors has been positive, adding that many people from New York City, Long Island and New Jersey have stopped in and given their approval. “People who really know what a good Jewish deli is like have given great feedback,” said Chessare. The deli currently five additional employees and Chessare said they hope to eventually expand the menu. Saratoga’s Broadway Deli is open from 9 a.m. to 4 p.m. Tuesday through Saturday and 9 a.m. to 3 p.m. on Sunday. It is closed Mondays. They can be reached at (518) 682-3416 or online at www.saratogasbroadwaydeli.com.